We set off around the shingle beach of the cove, legs began to burn and stiffen up, one of those walks where nothing appears to be getting closer. We then trekked through the forest which was full of swampy mud and slippery terrain. Finally we were on the top, and on flat grassy MOD ground about half way to the spot. I didn’t enjoy the next phase in the dark, skipping across greasy boulders, that seemed never ending as I wiped sweat from my brow. We arrived at the mark about an hour and 10mins after we had set off, now all that was needed was to climb up the back of this rock stack 100ft, on about a 45 degree angle, perhaps slightly steeper and climb down the other side to a series of angled ledges. Alex took a look and said “What’s the best way up this?”, as it’s something you look at initially and there is nothing obvious regarding the journey to the top, it looks bad, really bad. We got up there and I began to set up about 60ft above sea level, Alex; who I am now nicknaming Spiderman climbed down until he was only about 10ft above sea level, which made him designated retriever of fish. It was trick as when he climbed down, he jumped the last 12ft and didn’t 100% know if he could get back up. I had to ever so carefully throw his rods and bait bucket to him from 20ft above and I expertly laid on my belly hanging his rucksack on the end of the gaff at full capacity and even then I had to let go of it for him to catch, it was a complex operation to say the least. On the way back up, it was a job for the intrepid only, one slip would likely be fatal, sections of crumbly rock and no phone reception at all whilst trapped by the tide. Still, I’d been meaning to fish this again for over 2 years and excitement and ambition overruled any desires I had to be a pipe smoking pensioner one day. 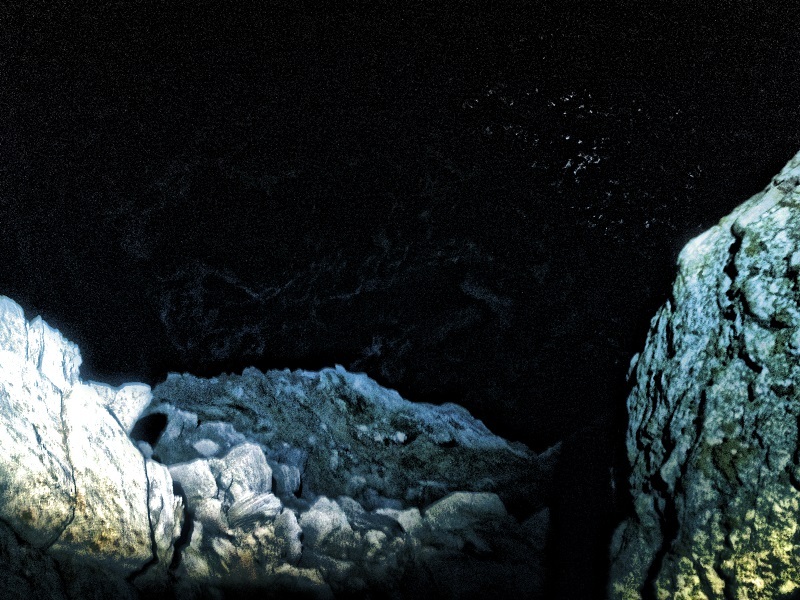 I had the same familiar haunting feeling as I looked over the precipice, down toward the sea beating at the rocks. Fear of heights had gone though, fear of death: check. This had made me evaluate my choices once again, but I was happy doing something I love, that few truly understand the beauty of. We both had taken one rod each with us, I had favoured my custom Century Excalibur & Alex had taken his pride and joy, the Century TTR. We intended to touch ledger, as it wasn’t a two rod spot and we wanted to connect with everything that came our way. The last time I was here I’d had big baits smashed every 5 mins and I’d had a very decent eel which I never got to weigh or photograph. 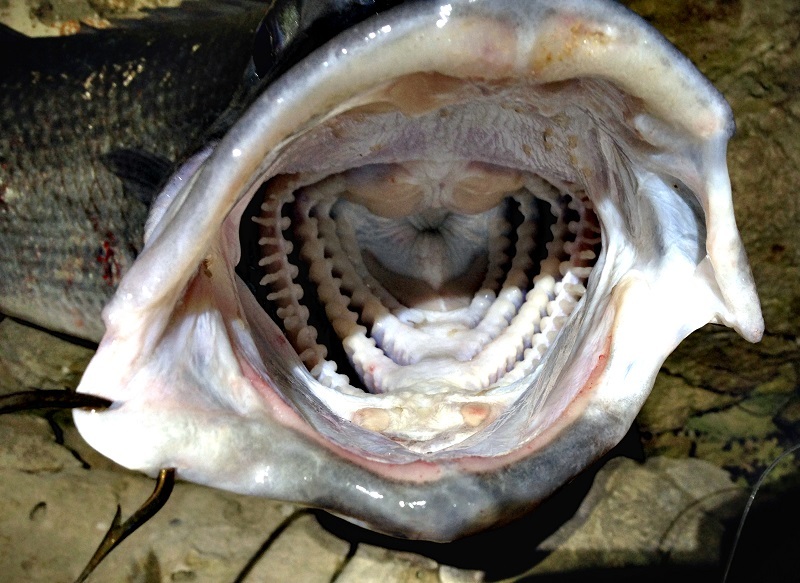 The place I’d describe as a Conger pit. A chain of rock stacks and reefs, kelp beds, varying depths, punctuated by sandy patches. Basically a tackle graveyard. To look at the place, it looks like something from the dawn of time, prehistoric. I cast out and was contently perched at altitude on my ledge. 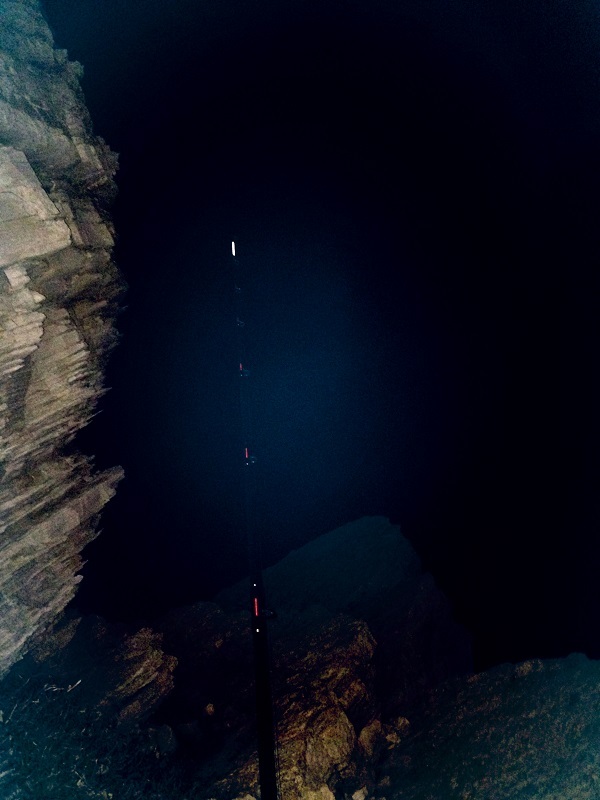 I could see Alex about 50 feet below me periodically rebaiting and flicking his head torch on his rod tip. I wanted to get a pic of this, but the head torch was never on long enough. 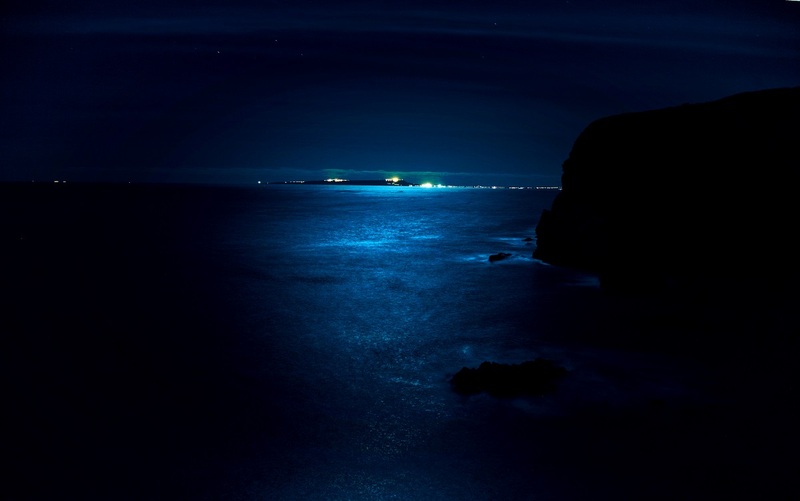 I gazed at the stars and in the sky, islets and rocky outcrops were glistening under the incandescent glow of the moon. I can honestly say the panoramic views I had of my surroundings were stunning, and I felt really lucky to be here. Part of me feared the moon may put a dampener of the fishing, as in my experience these nights only become fishy when the moon is tucked happily in a blanket of cumulous cloud. I was quickly into a bite, it genuinely felt like a Conger tampering with the bait. I hit it and I was straight into snag, which resulted in the first of many rigs and leads being lost on this cold winters night. Still, it was a very positive sign for me, fish on the prowl already and I’d only just got set up. Alex requested Redbull so I attached a carrier bag to my rig and lowered it some 50ft to him. I sprang into action, in a split second I stood and hit it, bang…….. Adrenaline pumping, I’d just caused a motor torpedo boat to change its course and boy was it motoring. I shouted down to Alex “fish on” and he leapt to his feet and made his way left, I pumped the Excalibur and kept the line tighter than a guitar string, as the fish kicked and kited. I could see something below in the spotlight of my head torch, initially what I thought I was seeing the white underside of a Conger, but everything about the fight of the fish was telling me Bass. I caught a quick glimpse as I guided it in to the rocks where Alex was waiting in the wings. The job was far from done, as he had a treacherous ascent onto rocks where the swells were pounding. I was worried about him, not the fish, he shouted communications up to me and eventually he had unclipped my rig and the fish was landed. A beaming smile was on my face, it looked like it could be a double, but only the scales would define it. 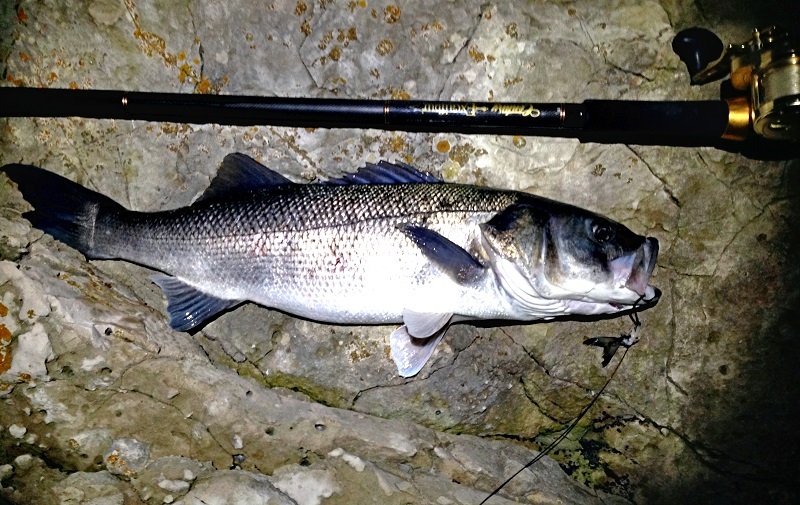 9lb 9oz of Dorset Bass. A new PB, what a beautiful fish, 5oz heavier than the one I’d had the year before, but still not a double, mixed feelings. We released her. There was that moment where hearts were in mouths as the Bass floundered by the surface upside down for a few moments, then she flipped, had a little paddle and swam off as if nothing had happened, this made me even happier. I called down to Alex and thanked him for his endeavours, it wasn’t an easy job and he had delivered. As he was running low on leads, I said in jest he could keep the one on the Bass rig for his efforts, he shook his head, but we were both losing leads like they were going out of fashion, so they became a commodity. I did ask him if he had thought about catching a fish tonight, to which he laughed, it was my turn to rub it in a bit, seeing as I have the Bass PB. I called down “It’s a game-fish isn’t it Bass?” ha-ha. Things now took a turn for the worse and it became very hard fishing indeed. The wind switched from a very mild North Westerly to a fierce South Easterly. I was bad news all round as huge swells began to sweep in, coinciding with high tide. The wind was bitter and the bites stopped/became undetectable. The sea went from clear to coloured and churned up within minutes. We lost rig after rig and rods came out of the water. Alex climbed up to where I was, we ducked round the side of the stack, out of the wind and sat and chatted for a couple of hours about just about everything. It was really hard work not falling asleep considering how long I’d been awake. We busted the piping hot tea flask out and sat and drank for a while. The ebb was here and we cast back out, seas were just too difficult in this spot, so after a few more snags, the horizon began to darken when the moon disappeared, and it looked like rain. We hurriedly packed up, as this was not a place to be when a storm comes in. We negotiated the slope back as carefully as possible, with barely any traction. The tide wasn’t far enough out, so we timed the waves and made a mad dash for it to get across. The boulders on the way back were now wet, slippery and it was even more of a tiring pain in the neck negotiation the route. The steps up made you just want to lay down and sleep in the hedge, to just give up. 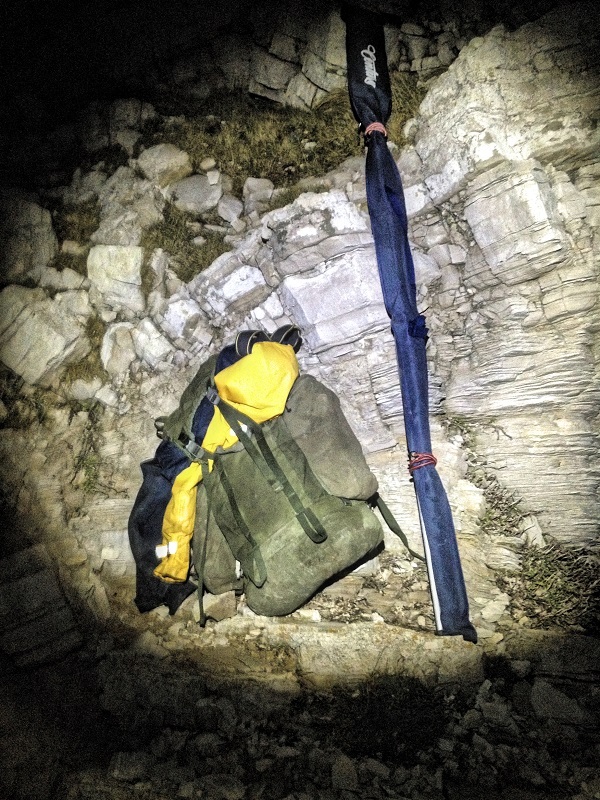 We tried to keep talking as much as we could on the walk back, anything to take our minds off the distance and the fact our rucks were cutting holes in our shoulder blades. Alex slipped in the mud on the cut through to the cove, which made me laugh, there was no way I was taking that route after all I’d been through that day/night. We saw two young deer and they let us get within about 5 yards of them, absolutely beautiful creatures. Eventually after a gruelling walk around the shingle bay, we had made it to the car, exhausted, broken, I know exactly why I seldom fish that place. So one fish between two of us, usually in January that would be a miserable pout, but tonight it was a hunk of shimmering silver magic. 2014 off to a flyer for me, a challenging night for Alex, but I still think he enjoyed it. We’ll be back for the next instalment, replenished and recuperated soon. Tight lines everyone, and may all of your fishy dreams be achieved in 2014.